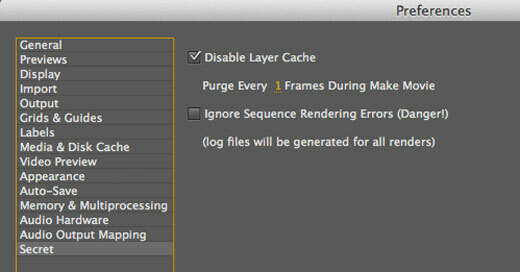 Did you know that After Effects has a secret preference menu that could save you a lot of headache on your next render? By holding down the shift key when launching the preference window a “secret” menu appears giving users more options they can set. Step 1; Ok hold down Shift and go to the Preferences menu and select any of the options. 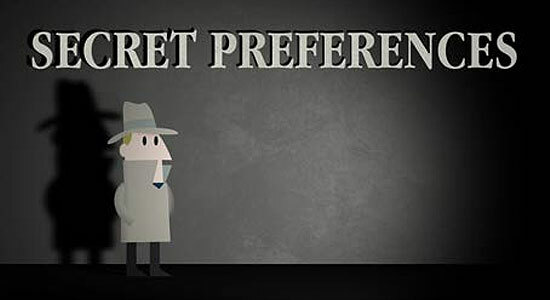 Step 2; Now when the window pops up go back to the drop down menu and you’ll notice there is now a “Secret” preference! Step 3; Inside the Secret Preference you’ll see an option to Purge Every ## Frames. You can now put in a frame number that will force After Effects to purge frames when rendering. Usually 0 or 1 frames is a good number to use. This will slow your rendering down a bit, but at least it’ll finish rendering without giving your any problems.